As the story goes, Noah was tasked by God to wrangle up a pair of every animal and bring them aboard a giant Ark, which was equipped to survive a flood intended to wipe the Earth clean. 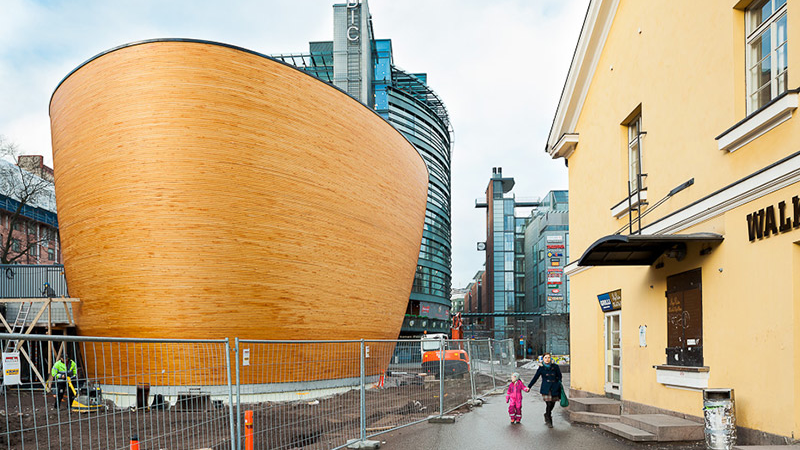 And looking at the Kamppi Chapel of Silence, built by K2S Architects in Finland, you can't help but suspect the Noah's Ark story was an influence in its design. The windowless, gently-curved building is constructed of solid strips of laminated wood glued together, and is intended to block out the noise of the urban environment it's surrounded by. Natural light seeps in through the top of the building, but the ceiling above ensures things don't get too bright. Who said church couldn't be fun?